14 “Again, the Kingdom of Heaven can be illustrated by the story of a man going on a long trip. He called together his servants and entrusted his money to them while he was gone. 15 He gave five bags of silver to one, two bags of silver to another, and one bag of silver to the last—dividing it in proportion to their abilities. He then left on his trip. One master entrusted three servants with various amounts silver. Two did what they could to use it to bring good to their master, and they were rewarded for it. One did nothing. He was sharply criticized and was no longer trusted with anything. I think this story so accurately describes our choice, when it comes to honoring God with what he's given us. This includes our talents and skills, our dreams, our worldly possessions, our time, and our love. It's obvious from the story that God honors those who use their "bags of silver" to honor Him. However, the part that I love most is verse 21: "You have been faithful in handling this small amount, so now I will give you more responsibilities." Wow. That statement makes my heart smile. I'll explain why. But in all of it, I felt like I was doing just good enough to get by, but I had no more left for God. The last thing I needed was more responsibilities. Although, I had few material things to give, I had more than enough love, compassion, and time to use on behalf of my Master. When I became faithful with this small amount, I began noticing positive changes in my life. Things started falling into place. My mind began to open up and my world looked less like a losing lottery ticket and more like a challenge, waiting to be accepted. I believe that by accepting the challenge of using what we have right now to serve and grow, our efforts will be blessed allowing us to glorify God and lead others to His love in bigger ways than we ever could by ourselves. And my favorite part of my favorite part is this: It is possible to grow the silver we have to work with. We are not restricted to what we are born with. God expects us to invest the time, money, and skills we have in ways that make us more equipped to serve him. We can develop our minds, our people skills, our habits, our money, our time... the list goes on. How many more people can we help and share the love of God with if we develop ourselves so that we have 5 bags of silver to work with? Not to spend lavishly on ourselves, but to honor God with. That's not to say that God is more proud of those with 5 bags than those with 2. The master in the story responded exactly the same way to the servants who did their best, no matter what they started with. But the amazing thing is, if we truly do our best, our bags of silver will grow. If we use 1 skill to develop another, now we have 2. Then we can use those 2 to grow more. 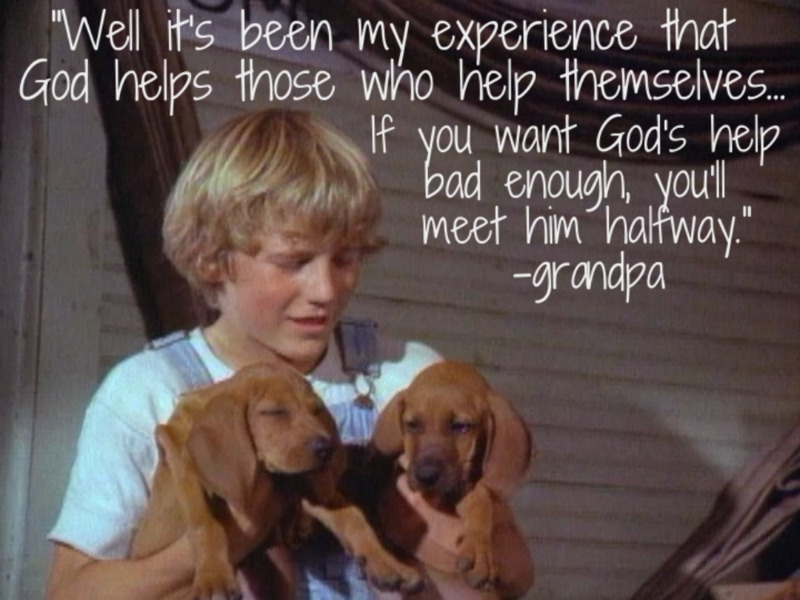 This great quote from Where the Red Fern Grows reminds me of God's power and how he blesses those that do their part to reach their goals and honor Him. It may feel like such growth is unrealistic or even impossible, but that's where God comes in. If we do our very best and give the results to God, we can trust God to do the rest. Not necessarily give us worldly riches, but to lead us to an abundant life and give us what we need to serve His purpose. I don't know about you, but this truth gives me peace in a time of unrest. It gives me hope for more in a time of little. I don't know about you, but I want to live each day to the best of my abilities so that I can have all the bags of silver I can to work with. Especially if it leads to an abundant life, having a positive impact on others, and eventually a great celebration with my Master.